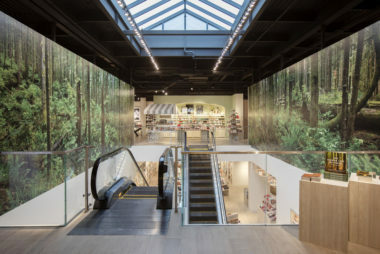 A large-scale photography installation by renowned Canadian photographer Edward Burtynsky featuring one of Vancouver Island’s most stunning ancient rainforests, Avatar Grove, will grace the walls of the new Indigo bookstore, opening today on Robson Street in downtown Vancouver. The installation incudes a short description of the importance and status of BC’s endangered old-growth forests and, thanks to the photographer’s support of our work, also mentions the Ancient Forest Alliance! Thanks to Everyone who Helped Make our Vancouver Spring Social and Fundraiser a Success! Thank you to all of our Vancouver supporters and the local Vancouver businesses who donated toward our Spring Social and Fundraiser on May 16! Because of your generous support we raised nearly $4000, pushing us just over half way to our $20 000 fundraising goal for Sept 1! Read on for more details. THANK YOU to Everyone Who Helped Make Our Year-End Celebration a Success! 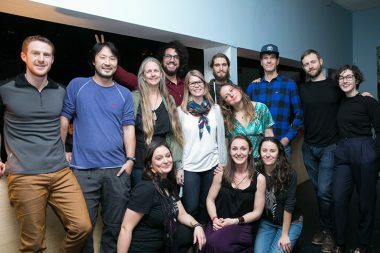 The Ancient Forest Alliance would like to send a major THANK YOU to everyone who helped make our Year-End Celebration on November 25th a great success! The night was filled with great energy, socializing, music, food, and dancing. More than 150 people filled the Victoria Event Centre to its capacity. Excitingly, we raised over $5000! A large portion of our proceeds resulted from the silent auction items that were generously donated by a variety of businesses and artists. We would also like Social Coast for helping to organize the event, Oliver Swain for his live performance, and C-Frets, DJ Rich Nines and Taquito Jalepeno for their time donated to the turn-tables. Without the support of everyone involved, we could not have pulled off such an enjoyable and successful evening. Thank you again. Please click below to view the full list of our business supporters and sponsors. 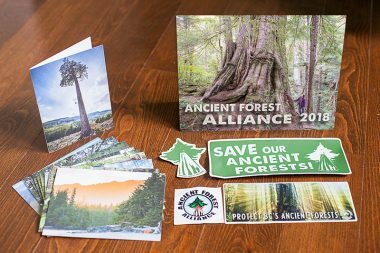 Make the Ancient Forest Alliance your holiday-giving priority by picking up some of our beautiful AFA merchandise and/or donating to our historic campaign mobilization. 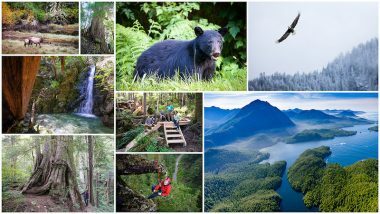 We're proud to present our 2018 calendar and our other products such as cards, stickers, certificates, posters and gift packs which are available for purchase with proceeds going toward protecting BC's endangered old-growth forests and to ensure a sustainable second growth forest industry. 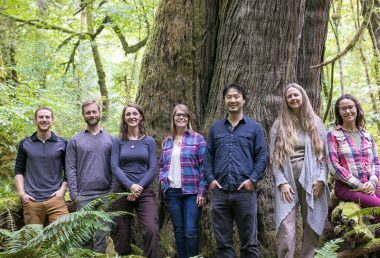 Join us Saturday, November 25, at the Victoria Event Centre (1415 Broad St) for the Ancient Forest Alliance's year-end celebration to honour our 8th year of operation, and the amazing community that has helped us get to where we are today! Enjoy some appetizers, drinks, and music with AFA volunteers, staff, donors, and supporters! The night will feature a fun and informative slideshow presented by the AFA's Andrea Inness, Ken Wu, and TJ Watt, followed by a meet and greet, silent auction fundraiser from 5:30 to 8:30 pm and then musical performances from 8:45 pm to 1 am. This is also a great chance to pick up Christmas gifts like our 2018 calendar. Come join us for a beer, relax, and have some fun! We are also very excited to announce that Oliver Swain will be playing at our event, followed by three local DJs! See here for a schedule and more information. Tickets are available for the presentation and/or musical performances. 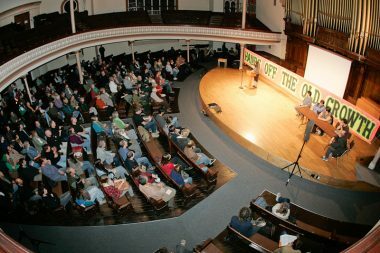 The election of a new NDP government supported by the Greens provides the greatest opportunity in BC's history to protect old-growth forests and end raw log exports. The AFA's Rally & Info Night for Ancient Forests and BC Forestry Jobs is our chance to let the BC government know we want protection for BC's endangered old-growth forests, support for First Nations land use plans, and a sustainable, value-added, second-growth forest industry. Your participation makes all the difference and will send a strong signal to the government that we want bold action now! This is our chance to send an unequivocal message to the BC government to protect ancient forests and forestry jobs! Please join us and spread the word – your attendance at this rally and info night is critical! For more information, contact us at info@ancientforestalliance.org, call 250.896.4007 or visit our Facebook event page. Thank You to Robinson’s Outdoor Store! 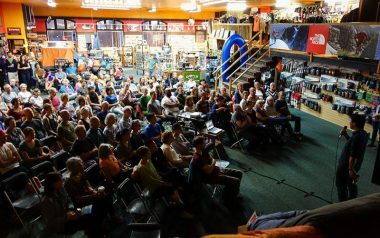 Thank you to Robinson’s Outdoor Store for hosting an amazing benefit night for the AFA with support from Patagonia, beer provided by Spinnakers, and the “Giant Tree Hunters” provided by Nootka Street Film! We are so grateful for their support and for all the 130 people who showed up to make it a stellar night – together over $3000 was raised for the AFA! Thanks so much to Erin Boggs and Matt King of Robinson's, to Ross Mailloux of Patagonia, to Steve Adams and Sean Horlor of Nootka Street Films, and to Spinnakers Brewpub for their tremendous generosity in supporting our campaign to protect BC's endangered old-growth forests and to ensure a value-added, sustainable second-growth forest industry! Victoria friends! 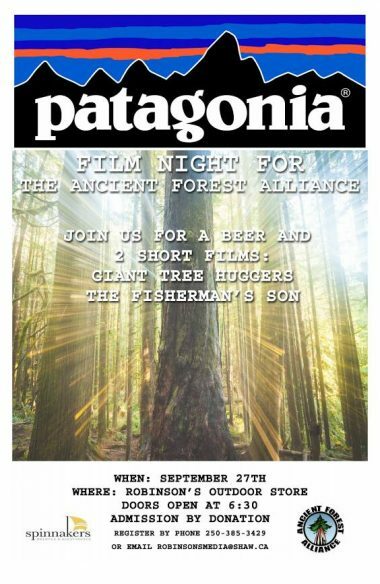 Please come out on Wednesday, September 27 to Robinson's Outdoor Store (1307 Broad Street, Victoria, Doors open 6:30 pm, Presentations begin 7 pm) who will be hosting in conjunction with Patagonia a film night and presentations as an awareness and fundraiser for the Ancient Forest Alliance!